What has everyone been up to this week? Sundance has been quite disappointing this season, with celebrities not taking advantage of the 'alpine chic' look. There have also been a few premieres but I didn't fancy making a post full of black suits, elegant as they might be. The most interesting outfit I've seen all week has been Ashton Kutcher's monochrome number above. 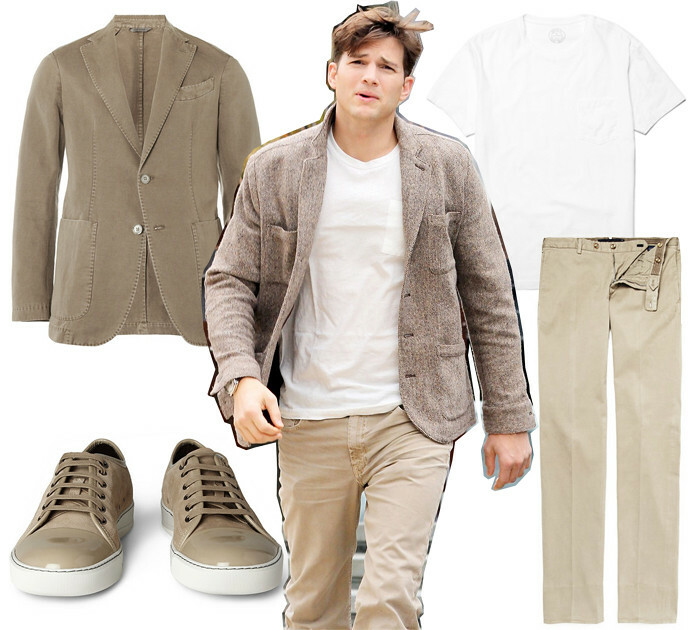 There is nothing chicer than a well put together casual outfit with different shades of neutral colours. And so I put together a similar look, which is perfect for the Spring. Instead of Ashton's light tweed jacket, I have gone for a slim-fit classic cotton one by Canali. I've paired it with a slightly lighter pair of slim cotton chinos by Slowear and a basic white tee with a pocket and a wider crew neck by J.Crew. Even though I can't see the shoes Kutcher is wearing I would like to think he didn't screw it all up with an ugly pair of shoes. I would wear the whole outfit with a beautiful monochrome pair of suede and patent leather Lanvin sneakers or a simple pair of white leather Nike's.